the political, religious, and economic strife that shaped her childhood and adolescence” (Tensuan, 956). It has the strange quality of a note in a bottle written by a shipwrecked islander. That Satrapi chose to tell her remarkable story as a gorgeous comic-book makes Persepolis totally unique and indispensable” (Arnold, Time Magazine). Arnold's strange analogy is fitting to Persepolis as Satrapi conveys a world many Westerners have only experienced from a Western perseptive. She senstively and truthfully illustrates her development into a woman amongst the trauma of revolution, war and repression - redefining the importance of the graphic novel as historically and autobiographically informing. The relationship between narrative and graphics. Satrapi’s black and white illustrations, for example, mirror the very repression that Marji and her friends and family face. For example, the veil is an extensively repeated image throughout Persepolis; and with it the illustrations seem to change. 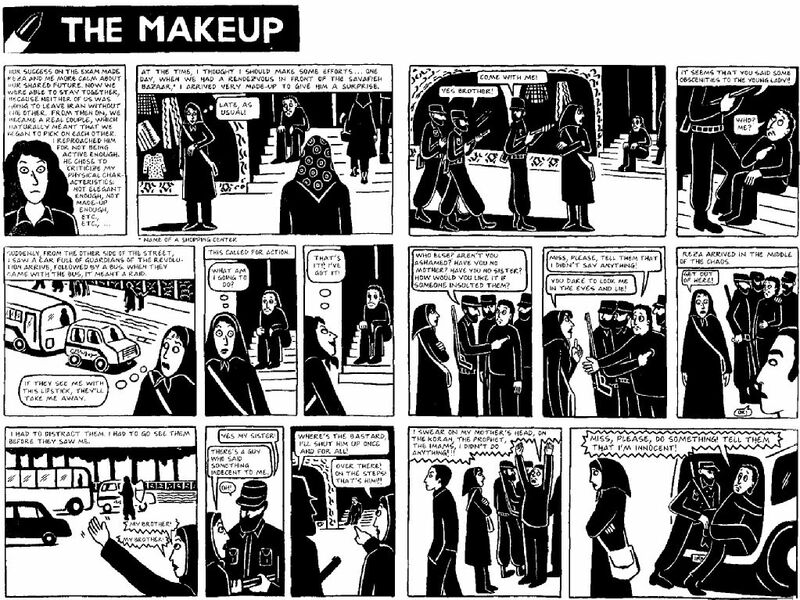 Whenever the children are depicted wearing the veil Satrapi’s graphics become plainer and unassuming – mirroring the uniformity of the girls. They are hardly distinguishable from one another, as they beat their chests to pay homage to their martyred “brothers”. Veiled women often appear in part one of the novel at moments of desperation and conflict. For example, the illustration below shows Marji being accosted and interrogated by two Guardians of the Revolution for being improperly dressed. The Guardians look unearthly and imposing as they tower above little Marji in their floor-length veils. This image shows how the veil was an empowering tool for women aligned with the regime, as they wore it with self-imposed superiority. Thus, the veil is both a weapon of oppression (victimising women by repressing individuality) and of superiority – mirrored in Satrapi’s graphics. Satrapi’s comics highlight the ways in which figures resist, subvert and capitulate to forces of social coercion and normative visions” (Tensuan, 954). And so, having shown how the Iranians are forced to surrender to the Islamist theocracy, it is worthwhile exploring how they rebel against it. For example, the juxtaposition of the two images below perfectly exemplifies the expected and actual responses to the introduction of the veil. This variation in veiling shows how Iranians developed a way of communicating their views and opposition without directly breaking laws of the theocracy. The positions of the children dancing and the blown up soldiers are almost entirely identical to each other. At least she, her friends and family can rebel in their own ways unlike these brainwashed teenage soldiers – tricked into believing the plastic keys painted gold that they wear will send them straight to paradise. Thus, Satrapi indicates her rebellion as insignificant as innocent boys were still dying in the name of Iran – they could not escape their persecution. This is clearly a child’s image of fiery death, but it is also one that haunts the text because of its incommensurability – and yet its expressionistic consonance – with what we are provoked to imagine is the visual reality of this brutal murder. One half of the image shows her surrounded by cogs, a hammer and a ruler – implying the influence of the mechanics of her “avaunt-garde” family. The other half, shows her fully veiled and surrounded by elegant Persian patterns, referring to the ancient traditions of her religion; Marji idealises Islam yet not in the same way the state follows. And so, as much as Marji revels in the rebellion against the theocracy – she feels torn between the religion she idealises and her liberalism. Satrapi’s perception of herself keeps fluctuating; she at once identifies herself as being other and so desires to conform with the Europeans. This moment shows Marjane repressing herself, thereby illustrating repression can come from within oneself as well as from external forces. She cowardly accuses a stranger of a graver crime than her own rather than face the consequences of her rebellion. Hence, now Marjane becomes the unjust agent of repression – resembling those that she protests against. Ultimately Satrapi’s journey, at all stages, is affected by repression. She and fellow Iranians suffer political oppression – repressing their personal freedoms; she experiences self-inflicted persecution as an outcast in Vienna; she momentarily becomes a similar agent of repression to those she hates and finally enters a marriage where she feels isolated and imprisoned. Therefore, Satrapi not only effectively and historically illustrates the trauma of war and political oppression but shows the personal (and sometimes unexpected) consequences of trying to escape repression. Her illustrations, often artistically reflecting her narrative, are charming and engaging – her novel is a testament for the power of the graphic novel in representing political and personal turmoil. Arnold, Andrew D. “An Iranian Girlhood” Time Magazine. 16/05/2003. Web. 19 May 2013. Chute, Hillary. 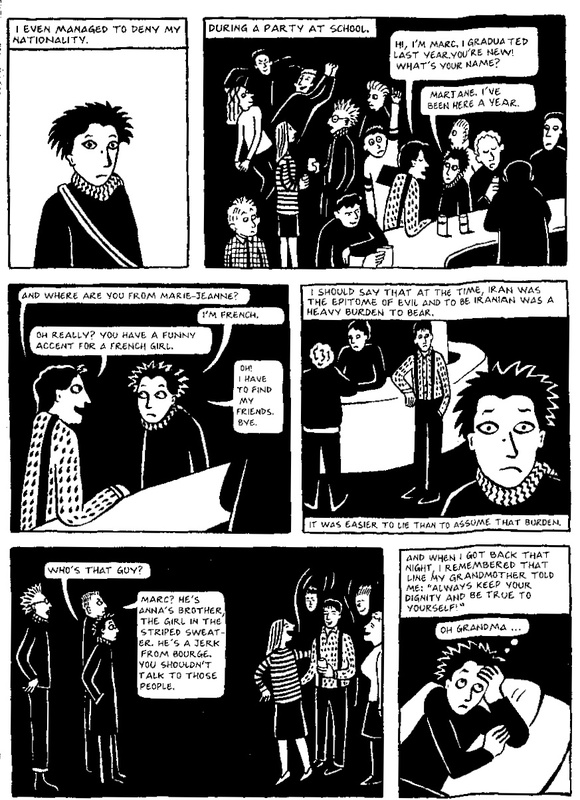 "The Texture of Retracing in Marjane Satrapi’s Persepolis" WSQ: Women's Studies Quarterly 36.1 (2008): 92-110. Web. 16 May 2013. Tarlo, Emma. 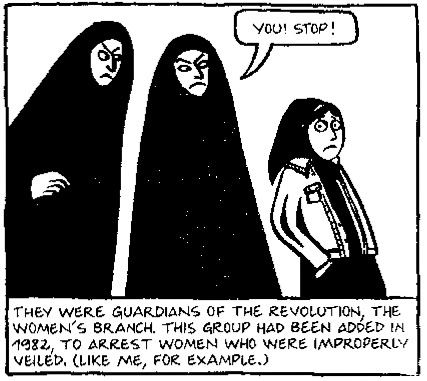 "Marjane Satrapi’s Persepolis: A Sartorial Review." Fashion Theory 11.2-3 (2007): 347-356. Web. 18 May 2013. Tensuan, Theresa M. "Comic visions and revisions in the work of Lynda Barry and Marjane Satrapi." MFS Modern Fiction Studies 52.4 (2006): 947-964. 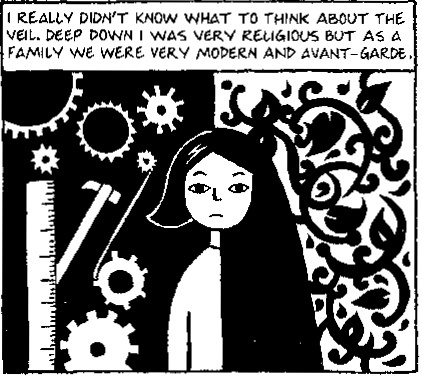 Davis, Rocío G. "A Graphic Self: Comics as Autobiography in Marjane Satrapi's Persepolis." Prose Studies 27.3 (2005): 264-279. Whitlock, Gillian. "Autographics: The Seeing" I" of the Comics." MFS Modern Fiction Studies 52.4 (2006): 965-979. Web. 16 May 2013. Naghibi, Nima, and Andrew O'Malley. "Estranging the Familiar: East and West in Satrapi's Persepolis." ESC: English Studies in Canada 1.2 (2005): 223-247.